I can remember being in the cafeteria in Colorado Springs, Colorado USA. This is where the Olympic Training Center for many sports is located including men’s & women’s indoor volleyball. This was exciting for me because I really didn’t many female players ever after playing four years in Junior and NAIA colleges in America & 3 years professionally in Belgium, German and Czech Republic. Sad day for a single guy. So while I am eating the guys start to chatter about some girls. I look up and see, like a stampede, a group of about 20+ players and coaches hurdling into the cafeteria for food after training. I’ve never seen such amazonian and athletically framed women in my life. I WAS DAYDREAMING!. No! This was reality and after that initial shock settled a few stood out. I asked about a few and amongst them was one of the tallest, a blond woman who was smiling, laughing and chatting and looked to be closer to my age than many of young new college level girls. It was Heather Bown. My teammates told me how she was one of the best players in NCAA volley and had been playing in Italy, my favorite country, for the past few years. They said she was one of the best players preparing at that time for Beijing. Yeah, that’s all fine and dandy but what I wanted to know was more like who’s single and is she one of them? Turns out no one knew since I was dealing with some guys a bit younger than my 24 yr old self. The moment came while on my way to training when I passed Heather who was coming from training and it was time to say our hello’s as fellow comrades let’s say. Bown was born in Orange, California and has an older sister. Played a lot of recreational sports like gymnastics, tennis, diving, deep-sea fishing, snorkeling, etc. Started swimming in high school & volleyball at 15 as a junior. Went to college at U of Hawaii & UC Santa Barbara for volleyball. Was a 2x 1st team D1 All American and WAC Player of the Year in her final years. Joined the USA indoor national team in 2000 until 2012. Currently in Graduate school and helping out Classroom Champions as a mentor. What was her light bulb moment? What was a defining moment in her career? What’s her current future plans? What her daily/morning rituals are? What is a personal habit that contributes to her success? The best advice she’s ever gotten? What she likes to do to add value to others? 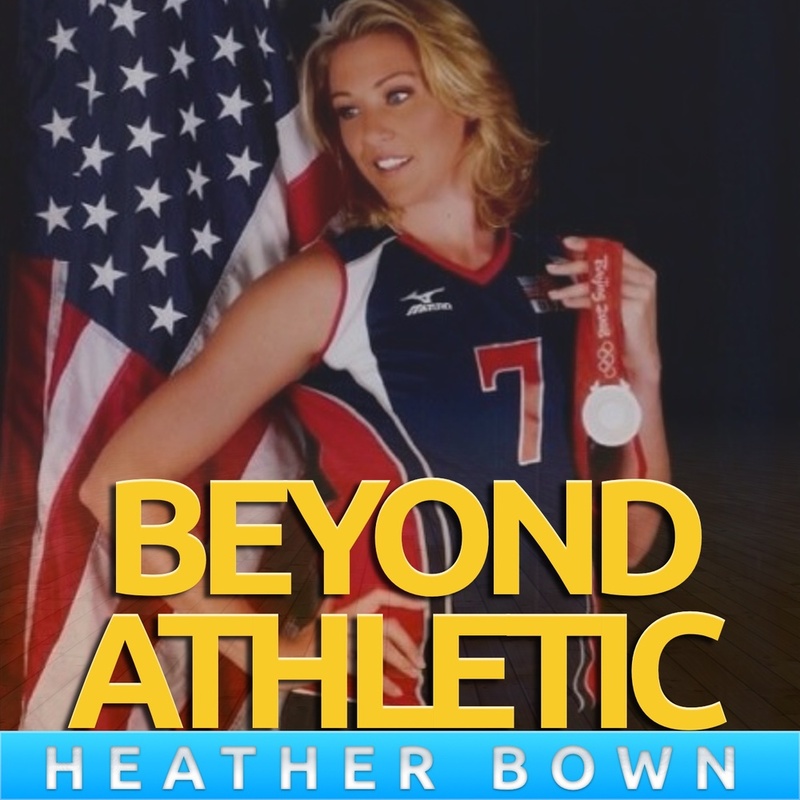 What’s her definition of an athlete being Beyond Athletic? "I was always told I'm not good." "it's not about focusing on winning or losing… You never really lose. You can always learn something..."
“When you are kid and everything is taken care of for you, you never really think past next weekend"
About three months ago Mira Golubovic mentioned two young athletes she was so impressed by OFF and on the court. The last episode was Branka (Brankica) Mihajlovic from Bosnia & Hercegovina… The second one is the lovely Suzana Cebic. It’s seems to be a common thing that the champion’s I have started out with all believe you should NEVER GIVE UP... Why? (Team Serbia national sports teams are actually all-around, one of the most winningest countries in the world speaking generally) I don’t want to spoil it but you find out in this episode. Get the details by listening! Has one older sister and grew up with both parents. Has earned over 13 medals in intl competition (9 are GOLD’s) & has been name Best Libero/Receiver” 3x international while playing major competitions with team Serbia. What’s her family like and her story? How she seeks big challenges? How playing a sport in Serbia while attending high-school? What are her plans after sports? Would she benefit from a program like Elite Sport Students? What’s her biggest obstacle in life? What was her most defining moment so far? What does she do to mentally prepare for competition? Why Going to College is still a big goal! "I think education is really important because after university you got a lot of opportunities"
"Yeah. It is good idea. It is good to have someone who will trust and who will give you advice." "Now, Usually I receive advice from my sister." How facing her obstacle of never being able to walk again fueled her to fight! "Learned to be a lot more patient, you have to be determined, learned to be informed about the situation." What she’s doing to become better mentally prepared even after 2 Olympics! About three months ago Mira Golubovic mentioned two young athletes she was so impressed by OFF and on the court. One was Branka (Brankica) Mihajlovic from Bosnia & Hercegovina. How is she from Bosnia yet playing women’s indoor volleyball for one of the best national team programs in the world.. Team Serbia? (Team Serbia national sports teams are actually all-around, one of the most winningest countries in the world speaking generally) I don’t want to spoil it but you find out in this episode. We sat down just days before the World Championships were starting and talked about how she stay positive and fights for everything she believes in. We had a special guest appear, one of the best players for men’s volleyball in the world…. Find out who by listening! Join The Beyond Athletic Team! Started volleyball at age 12 and International pro at 18 years old. Changed national teams for a challenge. Olympian by the age of 21! Played in Switzerland, France, Brazil and now Japan. All Star player from Grand Prix 2013 & as 4 medals of all three colors (Gold, Silver & Bronze). How she started in sports? How did she adjust to life abroad at such a young age? How does she approach challenges? How it feels to play at the highest levels? What are her habits for playing well? What are her daily habits? How she transitioned from pro to national team at 21 years old..
"You also need to respect yourself & respect others. If you are on the team it means that you are equally as good as them." Rewind back to 2005. I joined the 18 man roster after being on a tryout a month and a half earlier. Before that USA Volleyball had no idea who, Ryan Jay Owens, was as a volleyball player. I didn’t even exist to them… Well, it doesn’t matter, I made the decision to follow my heart which was dreaming of the Olympics and I made it on the team with current and former Olympians under the direction of Hugh McCutcheon. Well Hugh and Ron Larson decided I was a good fit only in a different position and that promised to teach me everything I needed to know to become the player I dreamt of becoming… at the end of that first summer Hugh came to me with a deal in Puerto Rico and after playing there for a couple weeks he recommended I take a deal down in one of the best leagues in the World, Brazil (BRASIL). I am not a crazy person. I accepted. First day on the job I was meeting and greeting my teammates at the court in San Leopoldo, Brazil in the south which is cowboy territory. Well like they say cowboys are friendly and sure enough after all the guys were met Carlos Schwanke asked me to go with him and another guy, Kid Teixeira for food. These are two Olympians from the Atlanta Olympics! I said as cool and calmly as possible, “sure,” while grinning like a school kid with a box of candies. Over the next months I would spend time with him and his family at their summer home and just get to know this amazing volleyball player, athlete, husband, father and future (now) coach. Listen for the his story and some fun stuff about us both. Born in 1974 in Santa Catalina, Brazil. Grew up in small city near Santa Catalina with his German father & Italian mother. Started with volleyball because of health at age 12. He played in 1996 Olympics in Atlanta and is a World League medalist. He had a decorated pro career entirely in Brazil. He now is a head coach and when he started as an assistant he immediately won three Super League (Top pro) in Brazil with a men’s team. What was his biggest obstacle? Who influenced him the most? what separates elite players from rest of the pack? How does he control his mind while playing? What is he most proud of? What has his life so far taught him? Who he would interview and why? Why adding value is important? “Doctors told me that i will not be able to play volleyball again,but with believe and faith i recovered." “..Trying to find something outside from sport: religion, faith, your goals… If you surround yourself with positive things and keep being better & better then you are in front of your opponents." "Most important thing is to have __(listen to find out…)___ in your life."